Work has recommenced on what is popularly referred to as the metal/steel structure at the St George’s General Hospital. The announcement of the recommencement of work on Phase 2 of the General Hospital project was made in July of 2014, at a joint news conference and signing ceremony by Works Minister, Gregory Bowen, and former Health Minister, Dr Clarice Modeste-Curwen, along with Mr German Gonzales, the Project Manager of Inversiones 7000 AC,CA, construction company. 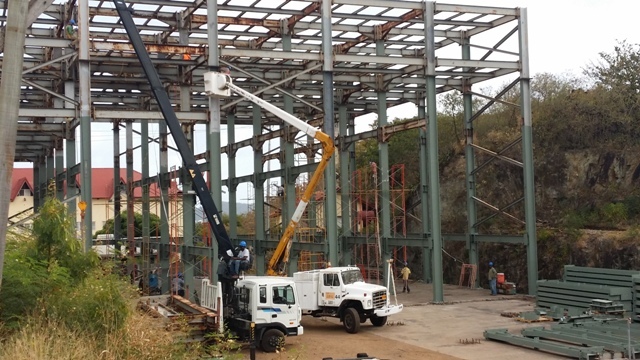 Phase 2 is divided into two components: Component one, at a cost of US$250,000 consists of the building, infrastructure with respect to the steel frames, where as the second component will consist of Accident and Emergencies, Laboratory and Imaging, etc. at a cost of US$1.03 million. Almost completed under that project is the refurbishment of the former Eye Ward. As part of the project, contractors will also carry out work on the Obstetrics-Gynecology ward. Phase 2 of the General Hospital project is a major development at the General Hospital as it relates to services delivery and access for investment. At last July’s signing, the then Health Minister Dr Modeste-Curwen told reporters that the continuation of Phase 2 does not in any way take away from our commitment to a new hospital. “A new hospital is very much on Government’s agenda and we are looking for alternative financing. The Ministry of Finance has held discussions with several entities that are interested in a public private partnership” she explained. The project is funded by the Bolivarian Government of Venezuela.